One night at London's Royal Opera House, 2,000 people in their best attire chatter excitedly as they take their seats for what promises to be the ballet event of the year. The curtain rises on Oxford, 1862, and Lewis Carroll reading stories to three little girls  one of them called Alice. When Carroll takes her photograph, he disappears underneath the camera cloth only to emerge in the form of a White Rabbit and jump down a rabbit hole. Alice plunges after him and the audience watches as the Royal Ballet company attempts to do the unimaginable: introduce a new full-length story ballet to the repetoire. In the ballet world, performances tend to fall into one of two camps: the narrative classics  Swan Lake, Romeo and Juliet, The Sleeping Beauty  and abstract, single-act works. Alice's Adventures in Wonderland, which opened on Wednesday, is the first original narrative ballet with a commissioned score that the Royal Ballet has produced in 20 years. Its last attempt was a forgettable production of Cyrano de Bergerac in 1991. After that, the company mainly stuck to abstract pieces. And the Royal Ballet is by no means alone in staying with what it knows  creating a successful new narrative ballet is notoriously difficult, as the time and money involved make it a hugely risky project. Christopher Wheeldon, the Royal Ballet's internationally acclaimed choreographer, admits that there are practical attractions to the short, conceptual pieces of dance that have been the fashion in recent years. "We all love the world of the abstract, because it's a safe world, and you are given the freedom to explore and discover as you go along," he says. "You're not being restricted to a narrative format." But he also thinks the discipline of creating a story ballet is an important one, especially for younger dancers who have only ever performed the tried and true storylines. "I'm working with a generation of dancers who aren't used to being asked to play characters from scratch," he says. "So this project has been good for everybody!" Even if one-act, abstract ballets are popular with choreographers, on the whole audiences prefer a good story. Traditional works still provide the financial lifeblood of any ballet company, since they appeal to everyone, not just dance aficionados. But arts consultant Derek Purnell, who was once chief executive of Birmingham Royal Ballet, points out that there is a limit to how many times the favorites can be recycled. "Unlike opera, ballet has relatively few 'classics,'" he says. "So rotating them is more difficult than it seems." Which is why Purnell believes it's vital that companies create new works that will do well at the box office and stand up to future revivals. There is no room on the ballet stage for a one-hit wonder. And the Royal Ballet's production of Alice's Adventures in Wonderland could very well be that much-needed new classic. It seems to give Alice's story everything you didn't even know it lacked. There's a tap-dancing Mad Hatter; the Caterpillar is a sultan whose harem lines up behind him to form a glittering body and line of pointed legs; the Cheshire Cat is composed of a collection of gigantic body parts, maneuvered around the stage by puppeteers dressed in black. Joby Talbot's score uses a collage of genres  from Broadway to Tchaikovsky with a twist  with a thumping percussion giving it an exhilarating unhinged quality. The role of Alice was created especially for dancer Lauren Cuthbertson, 26, and her beautifully childish "tantrum" solo, complete with a petulant stamping of feet, shows why. 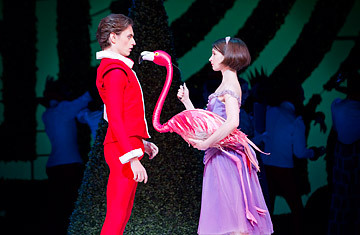 With his fittingly other-worldly pale skin and reddish hair, Edward Watson, one of the best-known principal dancers at the Royal Ballet, is both Lewis Carroll and the White Rabbit, a role that  despite his previous triumphs as Romeo and the Wicked Fairy in The Sleeping Beauty  he could have been born to play. And in an ingenious departure, the character of the Duchess is performed not by a dancer, but by one of Britain's foremost Shakespearean actors, Simon Russell Beale, whose famously expressive face lends itself well to ballet. Choreographer Wheeldon is aware that the story of Alice in Wonderland is a tough one to convert to dance. "Historically it's not really ever worked on the stage because of the episodic nature of the book, even though the characters are innately physical," he says. Yet it is that very episodic quality that makes the ballet such a success. The performance resembles a sequence of the short abstract ballets that modern choreographers like so much, but worked into a compelling narrative and completed with traditionally elaborate costume. When combined with Talbot's slightly deranged score, Alice's Adventures in Wonderland feels like the first ever authentically 21st-century story ballet. Curiouser and curiouser. See why Alice in Wonderland is in the top 10 Disney controversies. See TIME's review of Tim Burton's Alice in Wonderland.